On Sunday February 2, 2014, Rev. Tony Ponticello addressed the congregation at the Community Miracles Center in San Francisco, CA. What follows is a lightly edited transcription of that lecture. We are the dreamer of this world which is a world of dreams. This world is our dream, and that's the only cause it has. There is no other cause for this world. There's no outside force that's somehow influencing this world, making it what it is. It is strictly our dream. It is being dreamed by our mind. Obviously, our mind is not in our bodies. It's not the brain. It's the larger mind, the mind that actually fills the universe. Somehow the mind is having this strange dream of physical reality. That's the only cause that physical reality ever has. I think when I was a young boy, being raised as a young Catholic boy, the image I had of reality was that the world and myself were somehow in God's dream. God was dreaming us all – or this world and myself were being manifest out of God's mind. If you wanted to have a better dream, or to change the dream, you somehow had to please God. If you pleased God enough, hopefully, He would dream you a better dream. So, that's how you changed the dream. You lived the good life. You pleased God, and then God would, hopefully, change the dream. However, if the dream didn't change, then there was some big lesson in it that God wanted you to learn. What that lesson was would always be a mystery. You wouldn't understand why some terrible things were happening. It would hopefully be revealed to you at the end of your days, why you had to go through all this misery in this life, even though you were being a good person. A Course in Miracles says that's a ridiculous idea. (laughter) "God has no secrets. He does not lead you through a world of misery, waiting to tell you at the journey's end why He did this to you." (OrEd.Tx.22.7) God isn't withholding any mysteries from any of us. All knowledge is available and we can all have it. I think I liked this idea about the world being a dream because I had encountered it before. I frequently try to remember where I encountered it, but I don't remember where I encountered it. What I do remember is that I was very into Tarot cards when I was a young man. I got into them when I was a senior in high school because I read a science fiction book named Nova by Samuel Delany. It was an award winning science fiction book. In the book, it was in the future, they used Tarot cards and there are several Tarot card readings in the book, especially one in particular that the whole plot of the book flows from. So I got into Tarot cards and became a Tarot card reader, just casually. I did it a lot while I was in college. What I remember was that when I was reading the cards for somebody, as we were starting the reading, I would tell him or her that some people believe the world is a dream. I'd say something like, "While doing this reading, I want you to think of this world as a dream, some people believe that. If you're having a dream and the Tarot cards came out in a certain way that matched what was going on in the dream, you wouldn't think that was strange because it was all part of the dream. So just think of this world as a dream and when the cards come out in a certain way, they will match certain things in your life. It's not strange at all that this happens. Let's just suspend belief for a while and live in that possibility of the world being a dream." I remember saying something like that at the beginning of every reading I did. That I remember. I don't know where I got the idea that the world was a dream, though. I had played with that idea for many, many years. So when I encountered it in A Course in Miracles, of course, it seemed very familiar to me. I knew that was what I was supposed to do. I knew it, and I did my best to dream of his kindnesses. There have certainly been plenty over seven years. I did my best to dream of his thoughtfulness, to really select his thoughtfulness to dream about instead of doing this litany of all the things that have been going on the past couple of years that have hurt my feelings. I was really aware of how difficult this is to do sometimes when you're really caught in that cycle of resentment, and I was caught in that cycle. I kept trying, and I did my best. It did get better as the days went along. I feel pretty good about all this now. I like that quote for a number of reasons. First of all, it again has that idea that we're dreaming the dream of this world. Second, it's again instruction on how to dream a better dream, which actually I think is very key to A Course in Miracles. We frequently talk about what ACIM is, and how would we define it to people. There's a lot of things one might say, and it always varies, but I sometimes like to define it as a course in learning how to dream better. (laughter) It's a course that's teaching us how to be better dreamers. There's a lot of instructions on how to be a better dreamer. I remember years ago I studied the Carlos Castaneda material, and there was a lot about being a dreamer in that. The sorcerer, Don Juan, was instructing Carlos Castaneda to be a lucid dreamer and to take more control over his dreams. One of the techniques that he gave Carlos Castaneda was to, first of all, become aware when you're dreaming at night. Just become aware that your experience was a dream. Tell yourself, "This is a dream." That was step number one. Then, after you have that awareness, remember that you have an instruction, and the instruction is to hold your hands up and look at your hands. That was it. That was step number two. It's very simple, "Oh, this is a dream, and now that I remember that I'm in a dream, I'm supposed to hold my hands up and look at my hands and say to myself, 'These are my dream hands.'" I remember trying to do that for years. (laughter) I think I was successful once or twice. I remember when I did this it was very disorientating and very strange. It's scary to actually do that. I decided I didn't like being scared, so I stopped doing it. I can definitely see why that is a technique to become a lucid dreamer. That's probably a very good technique. It's not in A Course in Miracles, so it's not part of my spiritual path today. I have no desire to try to do that again. However, when I was studying the Castaneda material, I did try to do this. There is another interesting thing about this "dream softly" quotation and the instructions about dreaming a better dream that it is giving to us because it is not one of the times in A Course in Miracles where it's talking about forgiveness in any way. It's not talking about offering things up to the Holy Spirit and accepting the Holy Spirit new perceptions. The quotation is actually giving us a very active task. Think of your brothers' and sisters' kindnesses and think of their thoughtfulness. Don't sit there counting up the hurts they gave you. It doesn't say when you have a hurt, offer it up to the Holy Spirit and ask for a new perception which would be very consistent with much of the Course. This is one of the times when the Course is giving us active, definite things for us to do on our own. I like that. This instruction was very useful this week when I was thinking about all my relationships. Have you ever had the experience where one relationship has disillusioned you and then you start to think all your relationships are all disillusioning! (laughter) All of them are doing things we don't like. (laughter) All your friends and your family are disappointing you. When this happens you have to really grab a hold of that process and dream of your brothers' sinlessness, and dream of their thoughtfulness. We get this idea that things are leaving us. We are going to be lacking. Something or some things are being taken away, but what A Course In Miracles tells us is – no. The correct perception is, we're just realizing on some level, that this thing isn't valuable for us anymore. It doesn't help us. It's not a plus in our lives any more. It's not an asset in our lives. It's not helping us achieve the goals that we truly want to achieve. Actually, a higher part of our mind is letting go of it. Our higher self is merely moving away from this thing, even pushing it away. If we want to fight that part of us, we're just going to create a tremendous amount of conflict. We really need to surrender to what's happening and just let things be. I tend to resist this. I think a lot of people tend to resist this. I resist the change. I don't like change; nobody likes change. We resist. However if we're here to become eternal, or to remember that we're eternal holy children of God, then this is obviously going to take a change in our perception of things. We have to embrace that change. We need to learn to love the change and not resist the change. I was talking about Tarot cards earlier, and I don't throw Tarot cards much anymore. But I do occasionally. I especially like to do it when I am going through times of crises or times of challenge. I went through such a period about three years ago. Sometimes I do a full spread, but sometimes I just like to pick a card. I don't know how many people are familiar with Tarot cards, but there are 78 Tarot cards in a deck and they are similar to a regular deck of playing cards. However the Tarot also has twenty-two cards which are archetypal images, or figures, and they're not like the regular playing deck. They are called the Major Arcana cards. They're kind of like the Joker. Actually, in a regular deck of playing cards the only Major Arcana card that survives is the Joker. 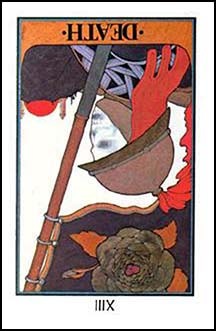 In a Tarot deck, a classic Tarot deck, there are 22 of these Joker type cards. So, if there's 78 cards total, and there are 22 Major Arcana cards, when you just pull a single card, that's a 28% chance, about one in four, that you'll get a Major Arcana card. The Major Arcana cards are all considered to be very powerful and archetypal, more cosmic. They usually relate to some powerful and dynamic things going on in your life. Several years ago I started pulling random Tarot cards every once in a while to help give me a little guidance about what was going on and a proper perspective of my path. Then an unusual thing happened. I wrote about it on the MOLDG (Miracles On-Line Discussion Group – the CMC community blog – it's pronounced "mold-g"). This was a long time ago so people probably don't remember, if you even read it at all. But I just kept pulling Major Arcana cards. So, the first time you do this, you don't think much of it because it's about a one in four chance. But twice in a row, the odds against you doing that are higher. It's a rarer thing. I think I did it eight times in a row, eight times over a period of a couple of months. Every time that I went to the Tarot deck, I pulled a Major Arcana card. I'm not sure how many of them I pulled in a row. It might have been nine. I was trying to look up the records today, but I couldn't find them. The card that was the eighth time, that was something like a one in twenty-five thousand chance that that might happen. The odds were really astronomical against this happening. Yet this continued to happen to me every time I'd go to the Tarot deck, there was not one time in between that I didn't pull the Major Arcana card. If you don't know Tarot cards, it's probably not what you think, but Death means "change." Reversed means, "resistance to change." (laughter) Change is happening; I'm resisting it. The resistance is causing me problems. Yep, that's it! Damn Tarot cards. But the world is just a dream. (laughter) It's just a dream and the Tarot cards are matching my dream experience. The truth is I should be dreaming softly of my sinless brother. I should be selecting all his thoughtfulness to dream about and over the past couple of days it's been a lot easier to do that. The truth is I have wonderful relationships. I've had wonderful relationships my whole life. They've been fulfilling, and meaningful, and unusual, and just terrific on so many, many levels – and very loving. I feel that way with all of you. I have wonderful relationships with the congregation here at the Community Miracles Center. I feel a lot of love for and from all of you – for and from all the people associated with CMC. I have wonderful, loving relationships with my closer friends. And I have wonderful, loving relationships with my intimates. I have a wonderful, loving relationship with Reverend Dusa Althea. I think it's our 23rd year. (Rev. Tony to Rev. Dusa Althea who is standing in the back of the San Francisco CMC.) Did we have our 23rd anniversary this year, is it twenty-four coming up? It's so many now, it gets a little fuzzy. I think we just had anniversary 22. Next year will be twenty-three. (Rev. Dusa Althea from the back, "Sounds good.") When I remember all my loving relationships it's easier to move into that energy of thoughtfulness. The only reason that anybody ever does anything that upsets us is because it's a reflection of the relationship that we have with God, with our Creator. We still have beliefs that our Creator gives us life and gives us death. As long as we still have those beliefs, we will manifest brothers and sisters who seem to give us joy and love and sometimes seem to give us sadness and pain. If we work on those perceptions with the brothers and sisters who are in front of our faces, it heals our relationship with God. That's the relationship that we're healing with all of our interactions with everybody else. Sometimes I've heard people say, "You know, I just want to work on my relationship with God. I need to go up to the mountain, or into the cave, and just meditate and pray and work on my relationship with God because my brothers and sisters are driving me nuts!" (laughter) I'm going to get away from them and just work on my relationship with God. A Course in Miracles is not that path. Maybe that works with other disciplines, it's not the ACIM path. We work on our relationship with God by working on our relationships with our brothers and sisters, by counting up all the kindnesses that they have given us and by selecting the thoughtfulness that they ever extended to us at any time. That is my dedication, and that is my goal. © 2014 Rev. Tony Ponticello, San Francisco, CA – All rights reserved. This article appeared in the January 2014 (Vol. 27 No. 11) issue of Miracles Monthly. Miracles Monthly is published by Community Miracles Center in San Francisco, CA. CMC is supported solely by people just like you who: become CMC Supporting Members, Give Donations and Purchase Books and Products through us.